Contrary to suggestions that the Amazon Basin was a sea of arid savanna during the Pleistocene, researchers have found that lowland tropical rainforest dominated the region just as it does today. Consequently, a relatively stable wet tropical climate similar to today's must have also existed. Such findings have serious implications for a widely accepted hypothesis explaining why the Amazon Basin exhibits such high levels of species diversity. Geochemists Miguel Goñi of the University of South Carolina in Columbia and Thomas Kastner, now of Anadarko Petroleum in Texas, analyzed organic matter in sediment cores from the Amazon deep-sea fan, an accumulation of sediment along the continental margin. The organic matter eroded from the basin and traveled in the Amazon River to the edge of the continental shelf between 70,000 and 10,000 years ago, a time when sea level was much lower than today. Goñi and Kastner looked at carbon isotopes and two sets of molecular biomarkers that indicate the type of vegetation that was the source of the organic matter. "If you look at a river that drains arid grasslands, you get a very different signature in the materials eroded from the vegetation and the soils than if you look at a river that erodes a tropical or temperate rainforest," Goñi says. 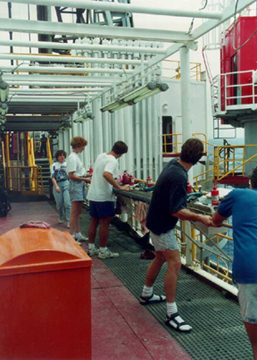 Researchers work on a sediment core while on board Leg 155 of the JOIDES Resolution drill ship off the coast of Brazil. During photosynthesis, temperate plants fractionate isotopes of carbon differently than arid plants. The distinct ratios of carbon-13 to carbon-12 that result leave an isotopic signature fixed in the organic matter. The Amazon deep-sea fan deposits had an average carbon isotope value of negative 27.5 per mil (or thousand), which indicates the organic matter came from temperate and tropical plants. "Those are extremely negative values and they are exactly the same as you see today in the Amazon," Goñi says. Had the organic matter come from savanna or arid grassland, the researchers would have expected carbon isotope values between negative 12 per mil and negative 15 per mil. The Refuge Hypothesis, proposed in 1969 by German ornithologist Jurgen Haffer, attributes the evolution of present-day biodiversity to plants and animals having been geographically isolated in the past. He reasoned that a cool, dry climate during Pleistocene glacial periods would have allowed vast expanses of arid grasslands to fragment the previously continuous tropical rainforest. Populations trapped in pockets of rainforest, or refuges, would accumulate genetic variations and eventually diverge into new species. Based on Darwinian ideas, the hypothesis caught on quickly despite sparse geologic and climatic data from the Amazon, a region that is still difficult to study. However, by sampling deep-sea fan sediments cored off the coast of Brazil during Leg 155 of the Ocean Drilling Program, scientists have now taken advantage of the natural tendency of a drainage basin to collect and concentrate basin-wide samples. Previous studies had analyzed Amazon lakebed cores for grass pollen, but found little that could confirm the presence of vast grasslands during the Pleistocene. Some of these studies were conducted by ecologist Paul Colinvaux of the Ecosystems Center at the Marine Biological Laboratory in Woods Hole, Mass. "This is the first paper which has a proxy that is unequivocally a measure of whether it was forest or savanna. And they've got nothing but forest all the way through," Colinvaux says. The conclusion that forest vegetation requiring a warm, wet climate prevailed throughout the late Pleistocene could supply evidence to overturn Haffers ideas about the origins of species diversity in the Amazon. "In fact, maybe one of the reasons for such extensive biodiversity there," Goñi says, "is that the climate didn't change that much." The Kastner and Goñi study also examined lignin, a cellulose-binding compound, and cutin, a waxy coating that prevents dehydration. Differences in the way various plant groups produce these biomarkers make it possible to identify the compound's origin  angiosperm vs. gymnosperm, or monocot (grasses) vs. dicot (trees). The values of lignin and cutin were also similar to values found in suspended sediment being exported by the Amazon River today. "Empirically, we see very little difference," Goñi says. The conclusion follows that present-day vegetation has predominated for the past 70,000 years, Goñi explains. "That is not to say that small changes could not have occurred, but nothing basin-wide, otherwise we would have seen it recorded in the sediments."